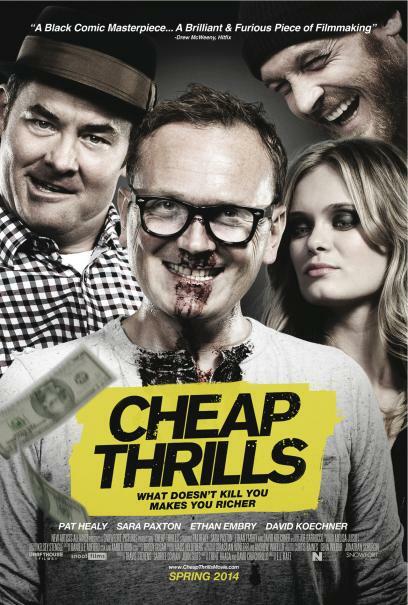 "Cheap Thrills" follows Craig (Pat Healy, "Compliance"), a struggling family man who loses his low-wage job and is threatened with eviction. In an effort to delay facing the music at home, he heads to a local bar and encounters an old friend (Ethan Embry, "Empire Records"). The two friends are roped into a round of drinks by a charismatic and obscenely wealthy stranger (David Koechner, "Anchorman 2") along with his mysterious wife (Sara Paxton, "The Inkeepers"). The couple engages the two friends in a series of innocent dares in exchange for money over the course of the evening, with each challenge upping the ante in both reward and boundaries. It seems like easy and much needed money, but the couple's twisted sense of humor pushes just how far Craig and his friend are willing to go for money and cheap thrills.